I am a total moron. I am stupid beyond human belief. I let greed overcome common sense. I am pathetic. This will now doubtless be quoted out of context, so let me add that this is not my normal condition. It occurred recently when I accepted a free helicopter ride, usual price £4,500, which I can well afford, to Henllys Hall Hotel in Beaumaris, north Wales. My helicopter pilot, Philip Amadeus, gets some of his machines from a nice chap, John Rodger. Through Philip, Mr Rodger offered me a return trip to his hotel. For everything else on my two-night visit, I would pay full price. I thought: "I've never seen Snowdonia, I liked central Wales, I'll go." I should have listened to Philip. "It's not the sort of hotel you usually stay at," he cautioned. 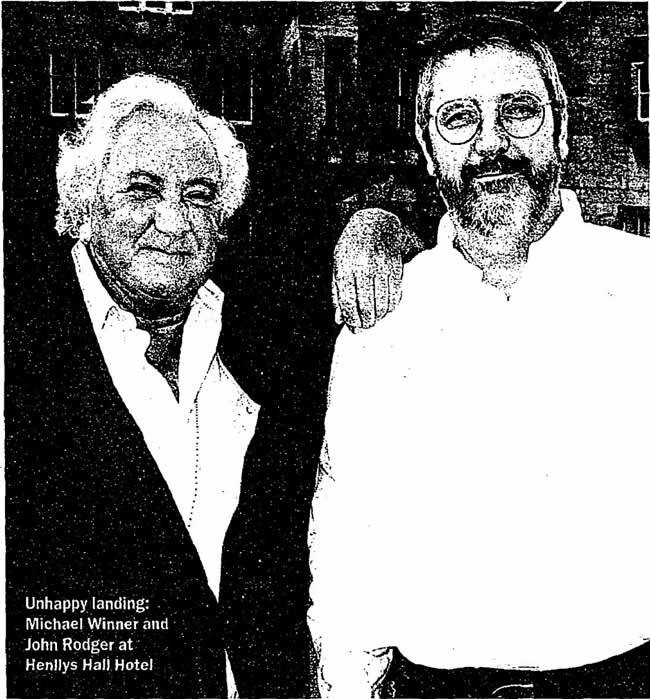 Mr Rodger should have listened to Philip: "I don't think asking Michael Winner is a good idea," he had said. Mr Rodger should have listened to me. "This may well be something you regret," I told him on the phone. "I shall write exactly as I feel." "I don't care what you say, I don't want no favours," was the reply, which I wrote down carefully in my diary. So I joined Mr R on his helicopter and an hour and 10 minutes later we landed at Henllys Hall, a splendid Victorian building with earlier foundations. We entered the lounge. A sense of foreboding engulfed me. The room had an awful, tacky bar in the corner in two shades of green with poorly painted pictures of medieval monks. The framed oils of noblemen could have come from the wall of a cheap pantomime set. Cold earl grey tea arrived. The triple-decker sandwiches and biscuits were okay. We went to our room. My heart sank, it was dreary. There was a repro four-poster bed, a dressing table, a chipped chair, a wooden-wardrobe and a single upright chair with arms. All seedy. The paintwork on the door was filthy with black fingermarks. The bathroom was tiny, the composition floor looked like cork with sparkly bits in it. The sink was minuscule, the bath plastic, the wastebin full of rubbish left by the previous guest. The taps were the wrong way round - hot on the right, cold on the left. There were two tiny slivers of cheap soap, no face flannels. The view wasn't bad. A lot of it was a recent golf course. I don't like golf courses at the best of times. This had tiny new trees which may look nice in 40 years, but I won't be there. Then there were fields, then the Menai Strait and Snowdonia. We retired downstairs to the dark olive-green leather sofas, surely from a sale at a furniture warehouse off the North Circular Road. The manager, Nick Brown, served us. "I find it extraordinary," I said. "You know I'm coming, you know I will write in detail about what happens, yet in the first half-hour the tea is cold, the door of the room is filthy and the bin in the bathroom is full of the detritus of the previous guest." "I know, it's disgusting," said Mr Brown. "When I heard I was disgusted." "What are you talking about?" I said. "You're not visiting from Mars. You're not passing through. You're the manager, you're responsible." Mr Brown exited glumly. "I wish I could talk to 'em like that," said John Rodger. "If I did, they'd walk out." John explained the "Victorian" oil paintings in his Hampton Court Restaurant came from Taiwan. "One person does the hands, one person the clothes and so on. A lot of splash for a little cash. The Americans love 'em." Luckily, his American group of art experts was off duty that night. At least that was a blessing. The freebie starter was scrambled egg. Nice. The white poppy-seed roll was fresh and warm. Then came the most amazing dish ever put before me. It was described as roast breast of wood pigeon, savoy cabbage, bespoke bacon with a rich game sauce. John and I tried to cut it. It was impossible. It resembled a theatrical rubber fake. It gave a bit, but no knife would enter. "It's uneatable," said John. Before the waiter took it away, he tried again, like a man who couldn't believe what was happening. He's a tough chap, John, but he made no impression on this pigeon. Over the weekend things stayed much the same. I could tell you of many more catastrophes, but I'm trying to expunge the whole visit from my memory. They say there's no such thing as a free lunch. There's also no such thing as a free helicopter ride. In his comments on the cutlery at Residence de la Pinede (Style, August 2), Mr Winner is not only gratuitously rude, he is also ignorant. In France, it is customary in the best circles (and therefore chic) to lay the silverware on the table with the forks and spoons pointing downwards. This makes the monograms or crests visible, as that is where they are engraved in France. (In England, the opposite is true.) To place the cutlery in the English way in a French home is considered vulgar - as one might find in a restaurant. We live in France and on a recent return visit to England went with some friends to the Chichester Theatre. We arrived early in the afternoon, so booked a table at the Minerva restaurant in the theatre complex. Our meal was bitterly disappointing. One of my friends' salads was served with a limp, sad looking endive; my fish dish was bland and swimming in sauce. Living in France we have come to expect better, whatever the class of restaurant. It is such poor standards that give England a bad reputation with foreign visitors. This place could do with the Winner treatment. Given Mr Winner's outstanding contribution to both the film industry and the art of culinary criticism, has he considered combining the two and making a foodie thriller? I picture something along the lines of Who Is Killing the Great Chefs of Europe?, with Michael himself as the baddie. Working title: The Knives Are Out.